People took to the streets in Isfahan and Karaj on Tuesday July 31 to protest rising inflation and the progressively unaffordable price of living. Videos of these street protests posted on social media show retailers in Shapour neighborhood of Isfahan marching on the streets chanting slogans against rising prices. 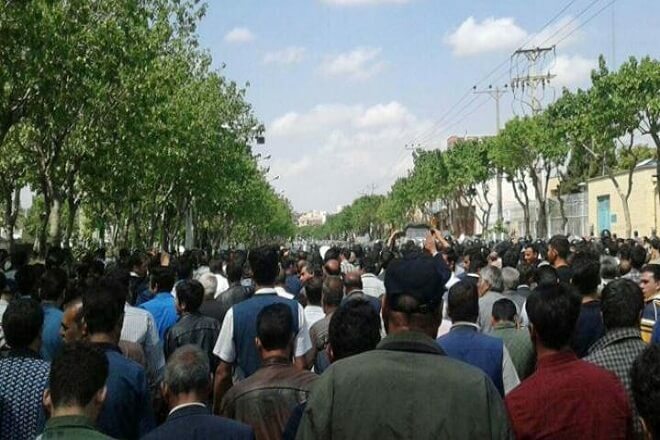 In Karaj, street demonstrations were accompanied with chants against the main factions of the Islamic Republic, the reformists and the principalists and the futility of their efforts at leading the country. Iranian currency, which has been consistently falling in value against foreign currencies, experienced a drastic drop yesterday triggering a rally call in social media to the public to stage street protests challenging the government’s inability to handle the economy. After the US announced its exit from the nuclear agreement with Iran, Iranian currency has begun a freefall. On Monday the dollar which was traded at 3,600 toumans last year could not be even found at over 11 thousand toumans. However, following Donald Trump’s offer to meet with Iranian leaders without any preconditions, the price of the dollar dropped slightly. According to Iran Census there has been a 4.4 percent increase in inflation compared to last month. Another report indicates that price of food products have gone up by 75 percent since last year. Some experts believe that official statistics are generally less than what the public is experiencing in the market. The central bank has been trying to control the fluctuations in the gold and currency markets with a number of strategies which have so far proven ineffective. Meanwhile the instability has triggered a high demand for the dollar and gold which inevitably has further exacerbated the fall in the value of the national currency. In recent months the Iranian police and security forces have arrested several individuals accused of disrupting the financial market. A number of Islamic Republic officials see the death penalty as a way of confronting the economic problems ailing the country and are now calling on the judiciary to use the death penalty more persistently as a deterrent against these charges.